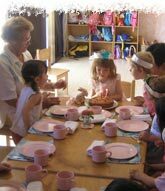 We celebrate each childs birthday by inviting their parents to school. The parents join in the morning and stay for cake and singing. 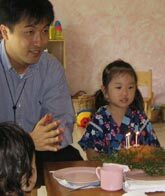 We bake the birthday cake together with the children and decorate the it with flowers from the garden. To the Chinese, the most important festival is Chinese New Year, which falls in either January or February. It is ushered in with the lighting of fire crackers at midnight on the eve of the Chinese Lunar Calendar. 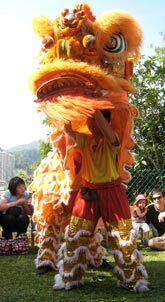 The colorful spectacle of Chinese New Year is evident long before the day of celebration itself. Eager crowds of shoppers can be seen searching for all kinds of seasonal delicacies: oranges for good luck, flowers and kumquat trees to beautify their homes. All debts must be settled and the house spotlessly cleaned before the new year begins. On the evening of the New Year, family relationships are remembered with a special reunion dinner to usher in the New Year. 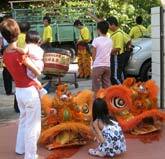 Younger members of the family visit their relatives, receiving red packets of lucky money (ang paus) while feasting and merrymaking. The Chinese Mooncake Festival celebrates the overthrow of the Mongols during the end of the Yuan Dynasty (120G- 1341 AD) in China. It falls on the fifteenth day of the eighth moon (August/September). The festival is celebrated with colorful lantern processions on the night of the festival. The other specialty of the festival is the Mooncake itself. These cakes are rich, round pastries filled with a mixture of sweet red bean paste, lotus nut paste, or salted egg yolk. It is said that secret messages of revolt carried inside these cakes led to the uprising which deposed the Mongol Dynasty. Christmas is a Christian tradition. It’s a celebration of the birth of Jusus Christ, son of God. Christmas evening is the 24th of December and is by tradition celebrated together with close family. Christmas day is the 25th. In the morning Christmas gifts are handed to loved ones. And time is again spent with family - eating, singing and in some countries dancing around the christmas tree.